I have been writing since age twelve, and have been publishing since age sixteen. Mostly, anthologies, and school, or college papers. I have taken every composition and literature course available in college, along with majors in business, and medical. I decided to publish two years ago, when I found a publisher who understood my humor, always wrote humor, but dabbled in children's stories. These stories developed into two books, with maybe more to follow, most likely more humorous novels to follow, writing all the time and having prolific amounts of notes and stories in my house. I came from a loving family of five children. My father had a great sense of humor, and Ma spoke glorious broken English, so I brought home grammar books from school to help her learn. We lived in housing projects in Revere, where we had close to nothing. Everyone else in the neighborhood had close to nothing also, so we didn't mind. My grandma came over every Sunday afternoon for dinner, and to argue with my mother. It was a relatively uneventful childhood, except for my imagination and my best friend Maura, who helped me get out of the library, and into some wild and crazy adventures. I got a lot of material out of those years, and wrote most of it down. 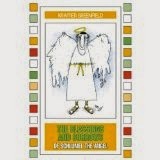 Kramer Greenfield has created a wonderfully wicked satire in this novel about Schlumel, a man taken before his time, because of an error in Heaven. To make up for the mishap, his superior(The High Mukkah Muk) and the Almighty decided to make him an angel, and give him extra powers to return to earth. Once back among humanity, Schlumel battles the problems of teen suicide, murder, water pollution and con men. He enlists the assistance of some quirky mortals to help out, since he only has two wings. The Almighty forgives him a few trespasses, because this angel makes us laugh, and has a very big heart. Schlumel is some angel! "His compassion, his cleverness, his reverence and especially his sense of humor make Schlumel my favorite angel ever." ----Rebecca Rule, author of Live Free and Eat Pie and numerous other books. For Submission Guidelines & Placement Slots-Please Contact Geri at Hrt4Angel@aol.com. Thank you. Please Contact Geri At Hrt4Angel@aol.com for Submission Guidelines & Placement Slots. Thank you!